Punching well above its weight, we reckon this guitar is an absolute steal for those on a budget. First impressions are very good. It's impressive that a guitar of this price has a pickup and pre-amp. 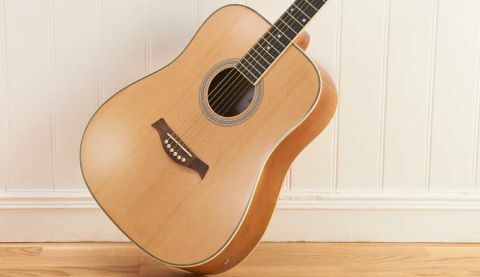 At just a shade over £80, Gear4music's electro acoustic dreadnought guitar is aimed squarely at beginners and guitarists on a seriously tight budget. Assuming that you get what you pay for, you have to wonder whether corners - and quality - have been cut, and just how good a guitar of such a modest price can be? First impressions of the dreadnought as it comes out of the box are very good; the curvy rosewood bridge looks classy and the high gloss natural finish of the laminate spruce top has an impressive sheen that belies the guitar's meagre price. The sides, rear, neck and headstock, while similarly lustrous and glossy, however, have been coloured with what appears to be a dodgy spray tan brown wood stain. Colour choice aside, this isn't a bad looking guitar. It's a classic shape, and we've seen less tidy finishing, binding and dot inlays on guitars at more than twice the price. The unamplified sound of the DN-10E-NT is bold and forthright, perfect for outdoor jam sessions and house party sing-alongs, with plenty of booming dreadnought-style volume. This guitar gives a full, rounded sound on strummed parts but communicates enough detail and rich harmonics to please fingerpickers too. The overall tone is very even with no exaggeration in any part of the frequency range, making the dreadnought a decent all-rounder. Intonation is excellent thanks to the compensated bridge. That means you'll be in tune whether you're playing open position chords, mid-neck barre chords or upper position melodic licks, and you'll still be in tune come the end of the song thanks to the dreadnought's sealed die-cast chrome machine heads, which feel steady to the turn and durable too. Although the fretwork on the dreadnought gives accurate intonation, a touch of vigorous vibrato and string bending reveals the limits of Gear4Music's workmanship as the strings grind against imperfect fret surfaces. It's a small gripe though, and is easily and cheaply sorted by any good luthier. With basic build quality being so good and the price being so low, we think this is a fairly minor issue issue. The neck is a chunky, rounded 'C' shape; great for taking a solid grip on when you're learning those challenging early chords, but still comfortable for more intricate melodic and arpeggiated playing. Any bigger would be too big, but as is, it's fine. The quality of the binding on the neck isn't quite up to the standards of the body binding, but this is purely cosmetic and doesn't affect the playing. The bottom line is that quality hardware and decent intonation make the DN-10E-NT a satisfying guitar to play for guitarists of all levels. It's impressive that a guitar of this price has a pickup and pre-amp. It's an under-bridge piezo transducer pickup routed through a preamp with four-band EQ and volume control, and it sounds perfectly adequate. The bass is satisfyingly full; if you're a beginner guitarist you will have a blast the first time you plug in, turn up your amp and feel the boom of the bottom end. Admittedly, there's a slight lack of midrange and treble detail that the guitar so readily conveys in its unplugged state; we found ourselves frequently twiddling those preamp knobs to find the best sound. This is a quibble though; the EQ is responsive and the tones you can get from the dreadnought are good enough to gig. Gear4music's website reports that there is a phase reverse function on the preamp, but we couldn't find this, however hard we looked. Taking everything into account, the DN-10E-NT is an excellent guitar that plays well and sounds great both acoustically and plugged in.